Couples love the Cottage! You can bring along kids too for a fun family vacation. Privately situated on 2 acres, conveniently located 10 - 15 minutes from downtown Asheville, and 5 minutes from quaint Weaverville. Cozy, charming, quiet, the Cottage provides a fully equipped kitchen, mosaic tile bath and is far from ordinary. Clever use of recycled materials. Fully fenced pet approved backyard with outdoor dining table for 4. Sleeps up to four,: 1 queen, 1 full size futon - located in same room. Sleeping arrangements suitable for family with one or two young children who can sleep in full sized futon in same room with parents. For more information on Weaverville, visit the towns website at http://www.visitweaverville.com/. The cottage offers easy access to all that Asheville has to offer including the Biltmore Estate, Grove Park Inn and Spa, the Blue Ridge Parkway (15 minutes to all these locations), hikes, waterfalls, mountain biking and glorious mountain vistas. For a real treat, head 25 minutes down the road to Hot Springs, North Carolina for a long and glorious soak in the fresh natural mineral hot springs located on the banks of the French Broad River. 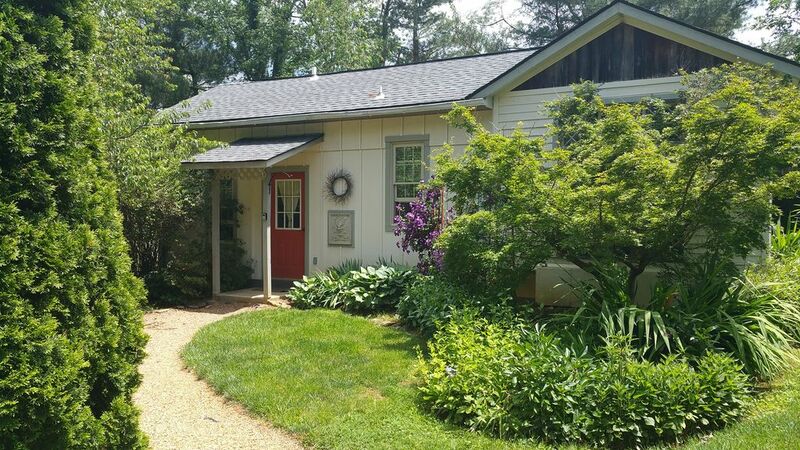 Relax and enjoy the colorful gardens and artistic custom-made features of the Wisteria Cottage. New super comfortable Queen memory foam mattress and a quiet sitting area with recliner chair for relaxing, reading and chilling out as well. There is a flat screen TV, but no cable, just an old fashioned antennae to access some local station. A DVD is provided and there is a Red Box for easy DVD rentals located 1/2 mile from the cottage. Fully-equipped kitchen to prepare your favorite meal. Eat out on the private patio, or choose from one of the many local delicious restaurants only minutes from home. Chilly night, a firepit is provided to enjoy an outdoor fire! The Cottage was built by French artists using recycled/reused materials such as weathered barn board as accents on the exterior siding and re-installed kitchen cabinets topped with custom mosaic tile counters. They believed strongly in making use of what others deemed not valuable. It is truly a unique and eclectic one of a kind space including a walk-in mosaic tile bath and custom stenciled concrete floor in the kitchen. The cottage vaulted ceilings make the space light and bright during the day, and romantic in the evening. The cottage is perfect for a romantic, cozy get-away for two, or for a couple with younger children looking to explore Asheville. The cottage is pet friendly, just be sure to let me know you will be bringing a pet (maximum of 2), and be sure to read and abide by some simple pet rules so that I can keep accepting guests furry friends. There is a fenced area for your pet out the back door (picket fence so very small dogs may not be well-contained). The cottage is tucked in and quiet, with a privacy fence in front and back, a fenced backyard with table, 4 chairs and umbrella, and gardens blooming throughout the spring, summer and fall. The parking area is shared by The Hydrangea House, a 2 bedroom vacation rental also on the property you'll see when parking but is hidden from view when you are in the Cottage/out back in the fenced yard. The cottage location is not in a walkable friendly neighborhood (no sidewalks and narrow shoulder) but it's an easy few minute drive to Weaverville where you can park and walk the neighborhood behind main street as well as the walking trail around Lake Louise, a short stroll from town. Lake Louise also offers a fitness area, children's playground and lots of ducks and turtles! I do not live on the property but am around many times during the week for yard maintenance and to check in with guests if you are not out exploring Asheville and the surrounding area. Everyone is welcome at the Cottage, I am lifestyle friendly. I am only a short distance away on the East side of Asheville, and available by phone/text should you have any questions. All you need to bring with you are your clothes, food and your adventurous spirit. Everything else is included! I have made Asheville my home since 1995 and would never live anyplace else! I'm an avid outdoorsy type person enjoying hikes in the woods, kayaking, camping, wildflowers, sunsets. In 2003 I purchased the property the Cottage sits on and lived in the main home (Gray house next door) for 12 years where I ran a small dog daycare/boarding/training business out of a 3rd building on the property. I closed that business in 2015 and moved to the Riceville area (East Asheville) with my then fiancé now husband, Stan. I have been renting the Cottage mostly as a vacation, occasionally as a long term rental, since it was purchased in 2003. It's very rewarding to provide such a unique and beautiful space for vacationers to the NC mountains. I also love dogs! My other job is organizing and producing dog agility events in NC and TN. I chose to purchase this property back in 2003 because I was drawn to it's unique and beautiful one of a kind mosaic artwork from the previous owners who had renovated the property and built the cottage on an existing foundation. The beautiful, quiet, peaceful yet very convenient location cinched the deal. I loved living on the property for 12 years and running a small successful dog daycare/boarding business, as well as managing the cottage as a vacation rental. My husband and I plan to return to live in the main house for our retirement, hopefully soon! Unique and beautiful custom mosaic tile work. Walk-in shower stall. Downtown Asheville is super easy to get to, just hop on I-26, a few minutes from the Cottage, and in 10-15 minutes tops, you'll be in the thick of downtown. Monitor heater in main living area. Infrared heater in kitchen/den/bath area. Living room and bedroom are combined, see photos for visual. Full size refrigerator/freezer. Ice trays provided (there is no ice maker). Four burner full size stove and oven. Basic spices such as sugar, salt, pepper, basic condiments such as ketchup and mustard. Fully outfitted kitchen including 4 burner stove and oven. Full size refrigerator. Indoor dining for two is a small bistro table. There is no indoor dining table for more than two. Seating for four is provided on the back patio. DVD Player. A Red Box for rental of DVD's is available a couple of minutes from the Cottage at the CVS. An assortment of CD's is available for your use. The Cottage is surrounded by gardens. The cottage does not have a washer and dryer inside, but please ask about availability of the laundry facilities located in the rental home next door if you will need laundry. Great cottage in a quite semi-secluded location- very clean and had everything we needed for a comfortable stay! Nice outside space and very convenient to Weaverville and Asheville areas- would definitely stay here again! Fabulous and fabulously clean cottage! This cottage was far above the ordinary vacation rentals with its charm and personal touches. Lovely fenced yard perfect for bringing your pet with you. We loved the convenient location and really everything about it. Great house for 2 people. Well kept! Cozy and restful! Very comfortable cottage and in a secluded area. Great fenced in yard for the dogs. Very convenient location to Weaverville and Asheville. We enjoyed our stay very much! The cottage was perfect for myself and my young Westie Marley. The fenced in yard was so nice to sit and have a cup of coffee while the puppy explored. We were looking for our perfect vacation home in the mountains, and Weaverville was a great place to call home base. The only problem was finding the trash cans at the end of our stay. We walked the property and looked where the book told us to (which Marley loved), but we never found them. I ended up putting it in my car, and threw it away in Asheville haha! I would definitely stay again, and bring my husband. to the large green building, due to inquisitive (and messy!) bear activity in the area. So sorry you felt you needed to take the garbage with you! The notes in the folder regarding check out also say to leave the garbage inside if you can't find the garbage cans. Hope you found the vacation home of your dreams! Some easily accessible activities include Hiking, whitewater rafting, Grove Park Inn & Spa, Biltmore Estate, North Carolina Arboretum, waterfalls, mountain biking, zip lines, art galleries, & incredible sightseeing along the beautiful Blue Ridge Parkway only minutes from the Cottage - it's all here! Pets must be declared and the pet fee of $50.00 (plus taxes) included in your payment.